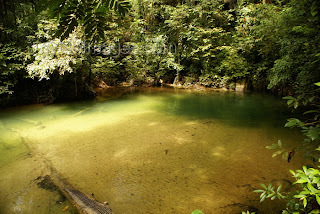 Sarawak’s Gunung Mulu National Park is one of its most spectacular natural attractions. Spread over 544 sq.km of virgin rainforest and crisscrossed by the fast-flowing Melinau and Tutoh rivers, the park offers a dramatic landscape, which features dense vegetation, magnificent karst formations and three towering peaks namely, Gunung Mulu (2,376 m), Gunung Api (1,750 m) and Gunung Benarat (1,858 m) which encompass a truly fascinating subterranean cave system. The park is known to be home to seventeen different vegetation zones featuring 3500 species of plants including 109 species of palms, 170 species of orchids and 10 species of the insectivorous pitcher plant. 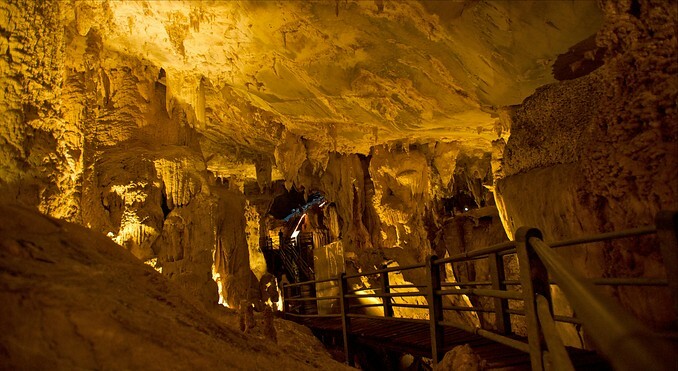 The cave system in Gunung Mulu National Park is perhaps its star attractions. This vast subterranean wonderland home to millions of cave swift lets and mighty bats, stretches for miles and includes formations like the one of the world’s largest cave passages, the Deer Cave, the world’s largest natural chamber capable of accommodating 40 Boeing 747 aircraft, the Sarawak Chamber and the longest cave in South-east Asia, the Clearwater Cave. At present only 254 km of this truly awe-inspiring system has been explored and excavations continue until today. The cave system of the Gunung Mulu National Park attracts visitors by the droves. However, you need to reasonably fit and able to tackle this expansive cave system for approach paths to the caves are quite difficult. For instance getting to the Clearwater Cave, Asia’s longest cave measuring 107km either a hike along a 4km nature trail or then a long and winding boat ride aboard a long boat on the fast-flowing Melinau River. Visitors usually stop at the Wind Cave at first; for it is located within the front half of the Clearwater cave system. The Wind Cave can be accessed via a plank walk from the riverbank. This cave is so called, for breezes from the Melinau River perennially cool it. The Wind Cave, like most other caves in the park is adorned with various spectacular limestone formations like stalactites, stalagmites, flow rocks and rock corals many of which are illuminated and are on display at the cave’s‘ Kings Room’. A plank walk from the Wind Cave leads on to the imposing Clearwater Cave. Visitors, who are unable to navigate the plank walk, can take a boat to transport them to the picnic area of the cave. A short walk up approximately 200 steps through the forest brings you to the entrance of the Clearwater Cave. The cave, which has an underground river flowing through it, is adorned with paths, bridges and plank walks for easy navigation. At the base of the cave lies a picnic area surrounding a crystal pool fed by water flowing out of the cave. Scores of dancing butterflies, swimming opportunities and the availability of ample park benches render the spot an ideal resting place after strenuous adventure caving expeditions.